Spring coats where I live are what my mother called "a snare in a delusion". The temperature bounced between -2C and 14C last week, but everyone's sick of heavy winter gear, even though there's still ice in the wind. But if you buy a light coat, you could wear it shivering in sleet. Since spring is so short, investing a lot does not make sense, unless it's a neutral you'd also wear in the fall, like navy or beige. But then it doesn't look exuberantly spring-like. I think that's the case in warmer locales too: fall and spring cast a different mood. Two of my spring coats are from my favourite resale store: an Escada butter yellow wool topper that was pre-owned, and a "new old stock" Anna Ma ria Beretta pale taupe spring-weight wool. The third I bought at a local boutique, a Chacok trench in a shimmery burgundy techno-fiber. That should keep me covered, but I would love the Pringle 1815 embroidered cotton trench, $595 from Net-a-porter. The colour and embroidery at the hem lift it from the mannish sameness of many trench coats. A leather jacket is useful in cooler-climate spring, but not in heavy black. 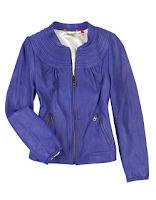 This, the iris blue Doma washed leather bomber, $505 (also from Net-a-porter) would be dreamy. If buying a raincoat, an interesting finish makes the coat seasonal. This Hilary Radley coat from Bluefly is pearl double-faced linen. (It's is deeply on sale for $159, but only available in size 12). I'm showing it to illustrate how a slight iridesence lifts a neutral. If you find one, grab it; they are rare as rainbows. 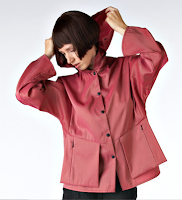 For a short rain jacket, I'd pick this elegant one from Babette's Spring collection. The rose will flatter everyone, and I prefer it to a wan pastel. I was in a meeting yesterday overlooking a busy street, and observing all the happy people walking by in the sun looking very chic indeed, without heavy winter coats. But of course here in Montréal at least 90% of them, men and women, were wearing basic black. Often with nice scarves. The Babette is lovely. I miss going to San Francisco to check out her store. Really, there are many reasons I need to get into NYC to look around; by the time I get there the need for a spring coat may have passed. lagatta: Black is supreme here, too but with some I have the feeling they just haven't made the change b/c worn with snow boots, which we haven't needed for weeks! mardel: Check the Babette web site, to see more from this season! I love that Pringle embroidered coat! But it wouldn't really be warm enough unless it was over 10C I think. Melbourne weather is probably much like your spring weather (in mid-winter) and I have a couple of long wool coats for when it's under 10C and then some lighter trench coats for when it's 10 - 15C and I want that extra coverage. Imogen, I only wear long woollen coats when it is under -5c. I'm very "frileuse" (suffer the cold) so I'd never say we are all tougher than people in warmer countries, but it is so horrible to be always encased in heavy winter coats. Duchesse, the people I was scrutinising yesterday had all stored their ugly winter boots. And they looked very chic indeed. Babette is lovely indeed, though I don't think rose is my thing. 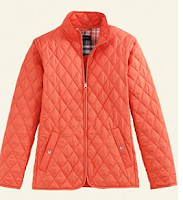 I prefer deeper reds, though there is something about the hue of that jacket I do like. My solution to the spring chill is a knee length knitted coat (aka a huge cardigan). It's too bulky to wear in winter under a coat and too heavy and warm to wear in summer, but in spring (which can be very long in Britain) it's perfect. And to give it a real Italian dressy look I wear it with leather gloves and of course a silk scarf.